On a scientific level I think many of us humans have come to recognize that we are part of Nature; that we exist only because the circumstances meet the needs of oxygen-based lifeforms. But on so many other levels we consider Nature separate – either wilderness to protect from us or resources to extract for us. We create mountains of trash that we bury or burn because we fail to take into consideration that there is truly no away – even though we see the mountains of garbage piling up; the mats of trash in the ocean; the discarded items along the sides of roads. Over the years I came to believe that we well-meaning environmental educators did more damage than good when we continued in the vein of our culture’s subscription to the Nature verses culture division. That just because our stuff didn’t belong left in the woods, somehow we didn’t either. By renaming a popular trailside trash-spotting game that I used to teach as a naturalist educator, from “The Unnatural Trail” to “Household in the Woods” and choosing usable items such as coat hangers, pencils, sneakers, forks, jars of jam, etc., I transformed the focus from simply spotting trash to observing familiar items in an unfamiliar setting. 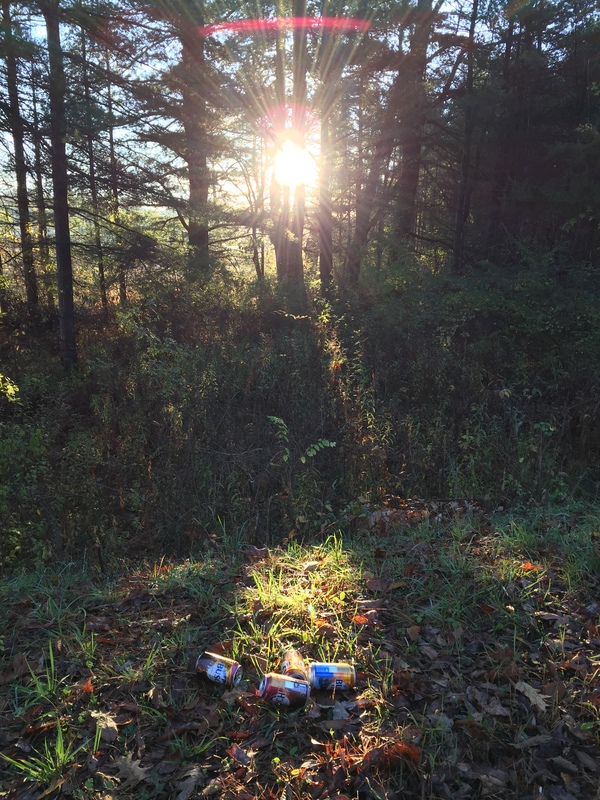 True, household items do not generally belong in the woods and need to be returned to their proper places among their human creators. However they are not necessarily trash, and certainly not “unnatural.” Human-made tools, trinkets, etc. all come from the Earth as raw resources. It is what we humans do to these resources that recreate them into something we determine to be useful. Biomimicry is “the design and production of materials, structures, and systems that are modeled on biological entities and processes.” Basically that translates to – copy Nature to make your stuff. Nature inspires humans and the proof is all around us. Look at a city and see a hive. Watch an albatross take off and soar and then notice how we rigged our jets to do the same. 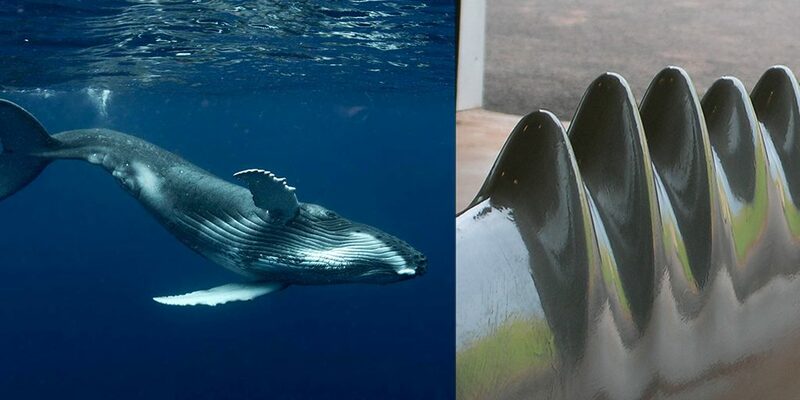 Observe a humpback whale slice through the water and then read how a wind turbine company is taking that fin design to create scalloped blades to cut through the air with more efficiency. We are getting better at designing for efficiency and effectiveness. We just need to better figure out – in our design – not after – how to create tools, equipment, and structures that will not just last, but also be able to be reincorporated into the Earth as new raw materials once we are through with them. Nature is the expert re-user/recycler. As part of Nature, why haven’t we humans figured it out better? We continue to implement cradle-to-grave tools and technologies, presuming the next best thing will save us from the last. But to live more sustainably and responsibly, we need to mimic the Earth, implementing cradle-to-cradle (C2C) tools and technologies so that little to nothing goes to waste; nothing is buried that is not re-appropriated for something new. Cradle-to-cradle design ensures that products are safe for human and environmental health before, during, and after human use. There are C2C certified products available now – from “biological-nutrient upholstery” made with rayon and wool to durable countertops made from 100% recycled glass, Portland cement, and non-toxic pigments to 100% compostable and biodegradable bath linens to plant-based cleaning products. Just to name a few. What else can this grand home called Earth inspire us to do? When we allow ourselves to wonder at the simplicities, built-in redundancies, and complexities of the world around us, and see the nested systems, the wholes-within-wholes, we can grasp that we are cells within the body Earth. And hopefully act accordingly. Let us put an end to this Nature-culture dichotomy. It is completely unhealthy to continue thinking that humans are somehow separate from the Earth in which we live. We live in it, breathe in it, use components of it, die in it, decompose in it, and become fodder for the next generation of souls. Humans need to understand that we are not “unnatural,” the things we make are not “unnatural.” We are part of Nature. However, this does not mean we should blatantly disregard the proper placement of our belongings and selves but to recognize where we fit in so that we more harmoniously live within our means and the capacity of the environment. Because: just because we are natural, doesn’t mean that we are not cancerous to the body Earth. Even most parasites recognize it’s self-defeating to kill the host. 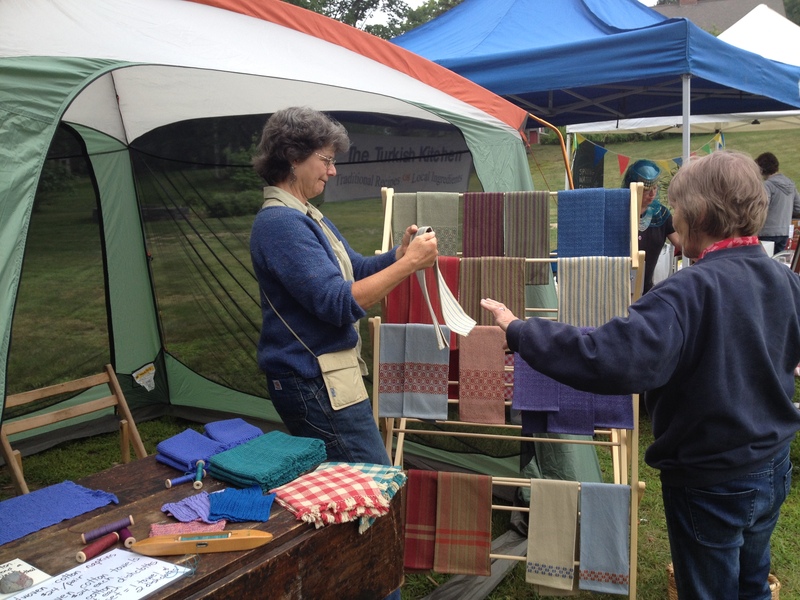 Irene Branson selling her homemade woven towels at the Ashfield Farmers Market. Start local: be a locavore as much as you can; source what you can from local labor, resources, and foods. When making purchases, consider the item’s use expectancy. Ask yourself how much you want or need it? This not about going on a guilt trip; just making you more aware of your choices. When making big changes to a structure, look up what biomimicry and cradle-to-cradle technologies you can incorporate in your plans. 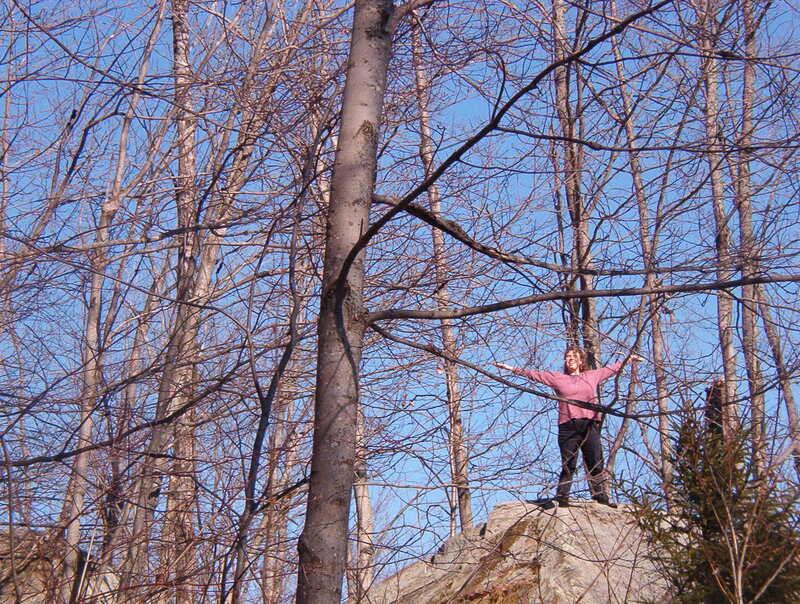 Take time every day to be in the elements and appreciate the sun, the precipitation, the air, the ground. This article appears in the NatureCulture section of the Montague Reporter, March 2019. 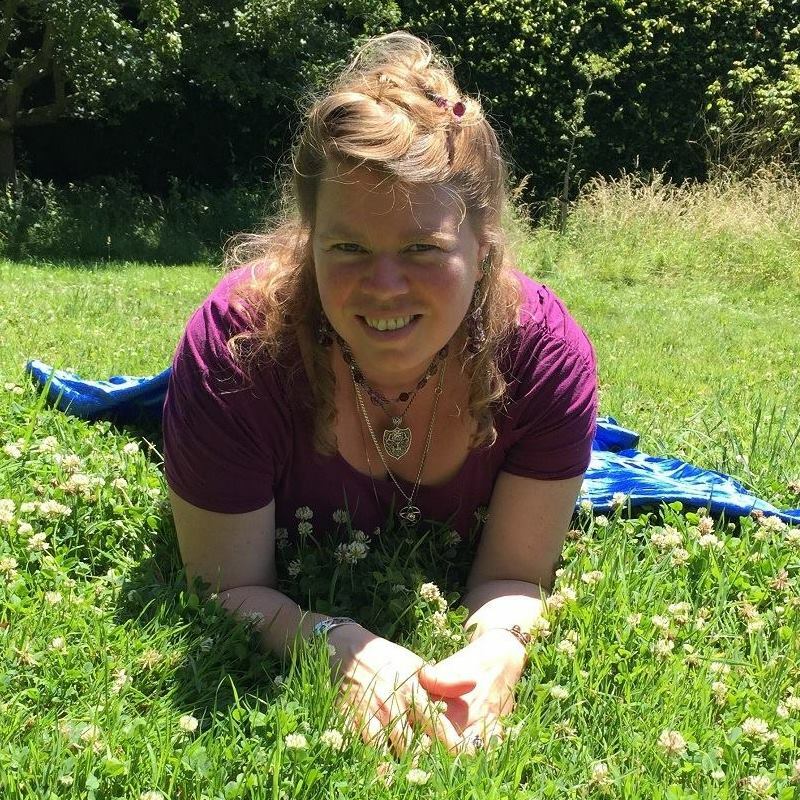 This entry was posted in Natural History, Natural Science, NatureCulture, Uncategorized and tagged Arianna Alexsandra Collins, biomimicry, cradle to cradle, cradle-to-cradle (C2C), Hearken to Avalon, Into the Outside, locavore, NatureCulture. Bookmark the permalink.